Monte Carlo offers four different water experiences including cascading falls. The Lagoon Pool is a 1,900 sq. ft. classically designed pool. The Easy River Ride is a relaxing, gentle, flowing lazy river that speeds up to 4 miles per hour. The Kiddie Pool is an enclosed area designed for the little ones. The Monte Carlo Wave Pool was the first hotel on the strip to design this wave feature. The Monte Carlo Beach Shoppe offers beach accessories. Personal beverage service along with a walk-up bar cart is available. A walk-up snack bar is available. Complimentary dark pink towels are provided. Tube and raft rentals are available. Only Monte Carlo guests are permitted access to the Beach Club area. One heated pool and hot tub are open all year round. Located next to the registration desk. A handicap chair lift is available at the Lagoon Pool. *All prices, hours, and dates subject to change, check with the hotel. Monte Carlo Hotel & Casino, Las Vegas got 2.5 stars based on 22 user reviews. It's a really cool scene. The music and DJ were cool and the scenery was great. The wave pool isn't all that exciting nor was the lazy river but they are fun, and the regular pool was cool because less people were in there as a result of the highly populated wave pool and river. I liked Monte Carlo a lot overall, I'd stay there again but I like to try new things. Monte Carlo gives the best bang for the buck. I too agree with most of the reviews, but if you are young, got a bod to show off, like to party and meet new peeps, this is the place for you! if you have kids or would like a very relaxing time try the MGM, its all GOOD its VEGAS!!!!!!!!!!!! Just wanted to update. Since the Aria & City Center have been completed this pool has a lot of shade & is very surrounded by buildings. This includes a monorail onramp where the passengers can look down on you while you lay out, it's kind of weird. The Pool is AWESOME!!! My wife and I were there on a Saturday 9/19 and DJ Rick had almost everyone there dancing in the lazy river and the wave pool. It was a blast!!! I say if it's too loud for you....then you're too old. Go some where else. Vegas is no place for children...please leave the kiddies at home. This was our first time at the MC. The River Pool was awesome! We bought the tall tube drinks and floated all day. Loved the DJ! The crowd was a mix of all ages. The wave pool wasn't very wavy and the larger pool was filled with young kids and old folks. For those complaining about lack of waitresses, the bar was right next to the pool - it took 2 minutes to get drinks. Stop being so lazy! We went to Monte Carlo because we have been before and always enjoyed the pool area with our kids. Not any more! Thurs-Fri there is an extremely loud club music DJ, the wave pool and lazy river are filled, filled with a bunch of drunk, oogling men and women who love it. 21 and over activity. Actually, I've never seen this kind of adult activity at a 21 and over night club. Women were ejected for flashing their breasts, we witnessed a near fight. They have to hire several security just to monitor the pools. Kids can not play out there on those days. Stay away. This was a great pool complex for little ones - it has it's own semi-hidden and fenced off kiddie pool. When I walked by it, I actually thought it was closed because no one was in it! My 4 year old and I had the whole pool to ourselves for about a half hour, then a few more people came in, but it never got too crowded. My son also liked floating the lazy river - we did about 12 laps around it before he decided that was enough.. lol. The wave pool wasn't wavy at the time we went in it. Up against the wall of the bar is a row of lounge chairs with a water mister overhead if you get too overheated. Not too many people used those because your belongings will get soaked if you leave them under the mister too long. I'd definitely go back again. There is now a lot of shade at the Monte Carlo pool due to the City Center hotels beside it. This is good or bad - depending on whether or not you like sun. The chairs here were really squeezed in close, and the music was a little loud for my liking. I guess they were trying to create a party atmosphere. I just returned, and the photos on this site are a bit dated. There are no cascading waterfalls, and not as many trees (they recently renovated the pool area). The pools are small, and over crowded. The lagoon pool is in the shade, and the others are full of kids. I visit a new resort every year, and I will not return to the MC because it's pool is horrible. I agree with the review that thought it was more like a parking lot. the monte carlo has the coolest pools in las vegas, at least thats my opinion and I totally reccomend to anyone that is going to las vegas to stay at the monte carlo the only bad thing about the monte carlo is that me and my family had a bug problem in our room but is wasnt that bad. I could tell you so many awesome things about this hotel but i dont have enough room to type it on. I liked the pool area and selection of pools. I liked that there was a good mix of shaded and sunny areas to choose from. The pool side beverage/food service was not good. The pool area is ok. Pool-side cockail service was horrible. We saw many servers, but none came close to our area. The lazy river was nice, good for the kids. It wasn't too crowded, even on the weekend we found chairs with no probems. 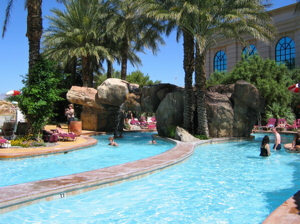 I liked the large variety of pools to choose from, although the lazy river was a little too crowded with kids. It was a little hard to flag down a waitress for drinks.